The upcoming week will keep a couple of Bollywood celebs on their toes. From teaser launch to one of the much-awaited releases of the year, few celebrities will keep their fingers crossed on September 13 and 14. Let us make it clear. After much delay, the teaser of Akshay Kumar’s 2.0 will be out next week. The project marks the first collaboration of Akshay with Rajinikanth. Besides, Manmarziyaan, which is slated to hit theaters on September 14 had a special screening last evening. We saw director Anurag Kashyap welcoming guests at the screening. Apart from these, we have other Bollywood celebrity news as well. Here are all the latest and trending Bollywood news and updates. Happy scrolling. Akshay Kumar shares new poster of Rajinikanth starrer 2.0, announces teaser release date. The teaser of the much-awaited film 2.0 will finally be out in next week on September 13. Starring Rajinikanth and Akshay Kumar, the big project has been directed by Shankar. The makers and the antagonist of the movie, Akshay dropped brand new posters announcing the teaser launch date and this has created excitement among fans. Sharing the news, Akshay wrote, ”Prepare for 2.0! Teaser out on September 13, 2018.” Full story here. Singer and composer Anu Malik created a song titled Sab Badhiya on the sets of the singing reality show Indian Idol and now it will be used in the forthcoming film of Varun Dhawan, Sui Dhaaga. Varun and his co-star Anushka Sharma made a special appearance on the show to promote Sui Dhaaga and after hearing the track, the lead actor was thrilled about it. READ full story. 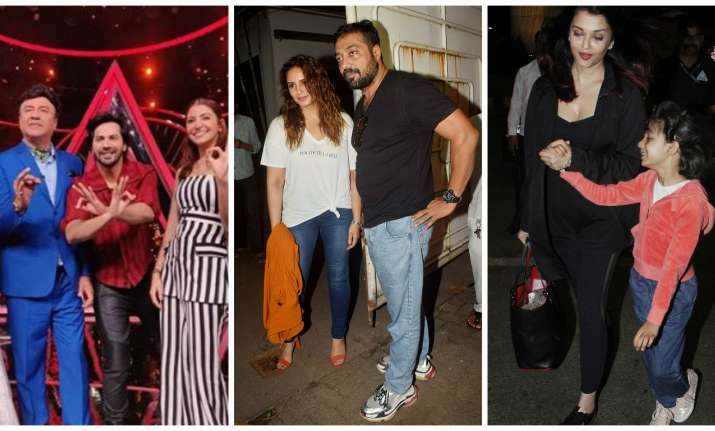 While the star cast of the film- Taapsee Pannu, Vicky Kaushal and Bachchan along with Aanand L Rai and writer Kanika Dhillon are busy with the musical tour, a screening was hosted by Anurag Kashyap in Mumbai. Several actors who have worked with Kashyap were present at the screening. Among them, Kashyap’s ex-wife Kalki Koechlin was also there. Mukkabaaz actor Vineet Kumar Singh, Huma Qureshi marked their presence at the Manmarziyaan screening. READ full story and see all pictures. Aishwarya Rai Bachchan is one of those actresses, who is known for her contribution to Indian cinema with her immemorable roles in Devdas, Guru among many others. The actress will be felicitated in the United States for her work. Aishwarya will receive Meryl Streep Award for Excellence at the first Women in Film and Television (WIFT) India Awards. Last night, she was spotted at the Mumbai airport along with her daughter Aaradhya as she was leaving for the US. Check out all pictures.